In need of a vacation that boasts fresh seafood, lush greenery, excellent coffee, live music, and panoramic views? According to the New York Times, Seattle, Washington, is one of the best places to visit in 2018. 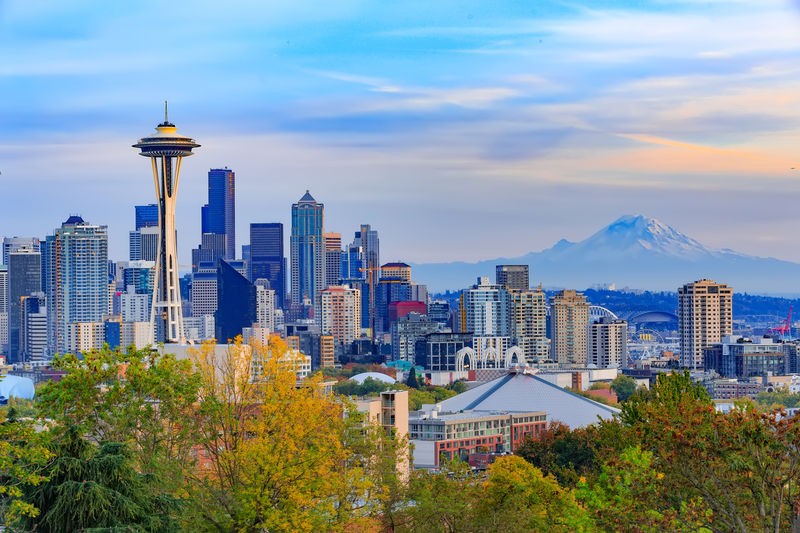 Home to tech giants, research institutions, and major professional sports teams, Seattle manages to maintain a local feel, offering residents and tourists plenty of street festivals, performing arts, scenic parks, and unique neighborhoods, each with its own unique flavor. Thankfully, there are plenty of regular, relatively-inexpensive flights between Fresno and Seattle. We pulled from travel site Skyscanner to provide you with a short list of flights and hotels handpicked with the trendy adventurer in mind. The cheapest flights between Fresno and Seattle are if you leave on March 5 and return from Washington on March 9. Alaska Airlines currently has roundtrip tickets for $159. There are also deals to be had later in March. If you fly out of Fresno on March 30 and return from Seattle on April 3, United can get you there and back for $243 roundtrip. Regarding where to stay, here are some of Seattle's top-rated hotels, that we selected from Skyscanner's listings based on price and customer satisfaction. One option is The Inn at the Market. Rooms are currently set at $175/night. Set in the heart of Seattle, this hotel is close to both the Pike Place Market and the Seattle Aquarium, as well as the Washington State Convention and Trade Center. Other attractions include the Space Needle. A second option is The Kimpton Alexis Hotel. With a 4.9-star rating on Skyscanner, the hotel is one of the most luxurious in the city. Rooms are currently listed for $175/night. Named as one of Travel + Leisure's Best 500 Hotels in the World, the Alexis Hotel displays original pieces throughout the richly decorated guest rooms and public spaces that showcase the diversity and culture distinctive to the Pacific Northwest. Our luxury 121-room Seattle boutique hotel is just steps from Pike Place Market, the Waterfront and Pioneer Square. If you're looking for a popular spot to grab a bite, Seattle has plenty of excellent eateries to choose from. Here are a few from Skyscanner's listings to help you get started. In Seattle's historic Pike Place Market, visitors press their noses against the windows to witness a vat of creamy white milk transformed by the expert hands of the cheesemaker. They watch as curds materialize from the milk, and then knit together to create a fine artisanal cheese. Although he is aided in the process by simple machinery, the cheesemaker is crafting cheese using the same techniques that have been used for 5,000 years. "Literally, I'm making a trip to Seattle solely to get Beechers Mac and Cheese," wrote visitor Sophia. "The sandwiches are yummy too!" Also worth considering is the Pike Place Fish Market Inc.
"The salmon on top of the spinach salad was amazingly moist, and the root beer float was decadent," wrote Christine. "Other restaurants were packed and had a long wait -- we went right in and were seated with great service!" The Piroshky Piroshky bakery was started in October of 1992 by the Kotelnikov family. The word Piroshky originates from the Russian word "pir"which means feast. It is a hand held meal in the form a stuffed pie with a variety of fillings. The beauty of Piroshky is that everyone makes it a little differently. Seattle is also full of sites to visit and explore. Here are some popular attractions to round out your trip, again from Skyscanner's listings. First up is the Pike Place Market, arguably one of the most popular destinations in the city of Seattle. Home to the second location of the original Starbucks store, the market first opened in 1907. With area farmers, craftsmen and independent merchants selling their wares throughout the market, tourists and residents alike flock to this unique part of Seattle. In addition to the market stalls, buskers and street performers are a popular fixture. An iconic landmark left by the 1962 World's Fair, the Space Needle comprises the most recognizable feature of one of the most famous skylines in the world. Climb to the top for 360 degree views of Seattle and get your souvenirs at the gift shop on the bottom floor. The rotating restaurant, Skyline, serves up dizzying dishes and a rare experience. "You can't miss the Space Needle when in Seattle," wrote visitor Juno. "Such an iconic landmark of the city. The area around it is also very charming to walk around." Finally, spend some time at The Waterfront Park. It may be a little hokey, touristy, and geared towards the family-traveler, but that doesn't make the Seattle Waterfront any less appealing for its spectacular views and the summer concerts to which its piers play host. "Great place to go for an easy walk and to get views of the mountains," wrote visitor Taylor. "You'll see the Olympics and Rainer, along with the islands out in the Pudget Sound. ... Be sure to check out the sculpture garden if you're in the waterfront, it's too close not too."